This information is provided by Kingdom Yacht Charters LLC. Please confirm all details direct with them prior to booking. 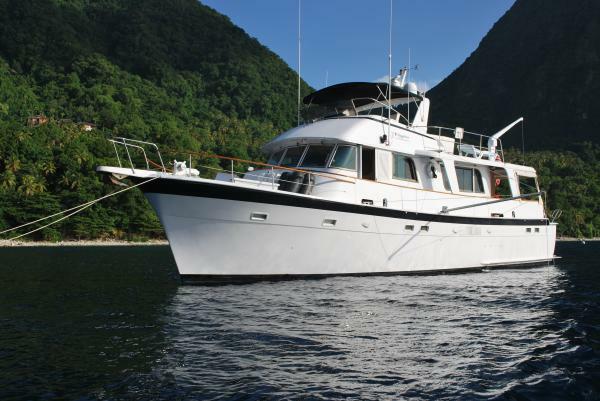 Yachting Limited neither endorses Kingdom Yacht Charters LLC nor guarantees the accuracy of this listing. 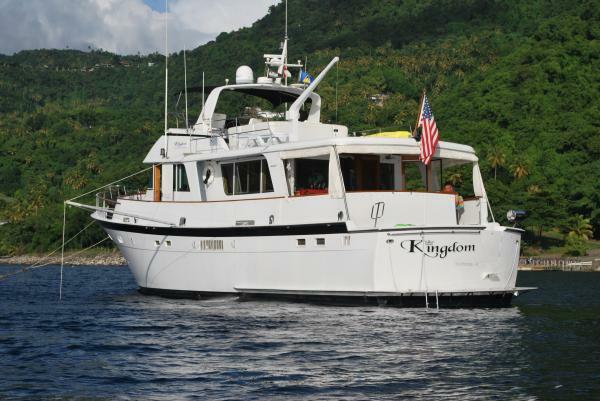 Explore the Virgin Islands aboard Kingdom, a spacious and elegant 58’ Hatteras Motor Yacht. Our crew will treat you like royalty, while you cruise comfortably from one destination to another. Visit white sandy beaches and quaint Caribbean ports of call. Swim with colorful tropical fish in warm crystal clear turquoise waters. Dine on gourmet meals aboard, and sample the cuisine of charming local restaurants. Be inspired by history and awed by the surrounding beauty. 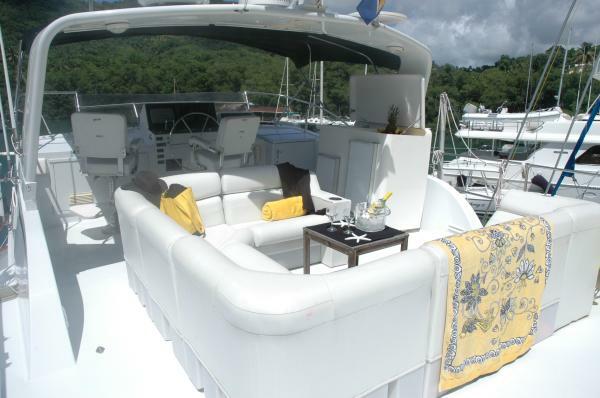 Come and enjoy a private yachting experience, where you can go where you want to go and do what you want to do. 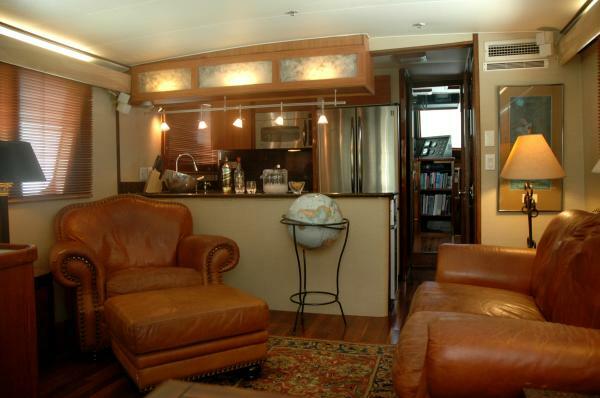 The vessel is stabilized for comfort, fully air conditioned, and tastefully appointed throughout. Decks include sunbathing and shaded lounge areas, and of course snorkel gear and kayaks are available. Aft deck dining al fresco or in the salon is always an enjoyable experience. Guest staterooms boast en-suite baths, closets and operable port windows. 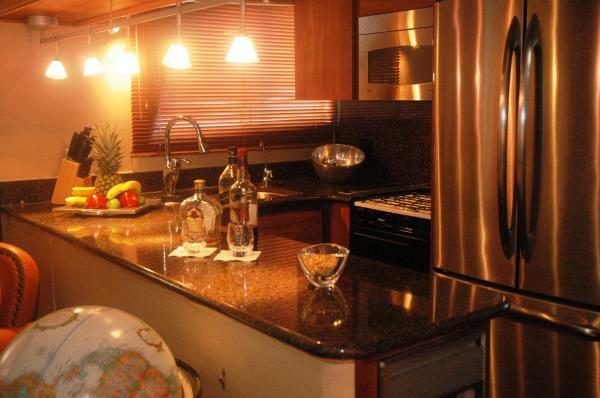 Our chef/hostess will provision the galley based on carefully planned menus to suit your tastes. The Captain will chart your island itinerary around your personal preferences. Arrangements for all special tours, scuba trips or other activities will be made as you wish. Aboard Kingdom your enjoyment is our first priority. High Season in the Virgin Islands begins after the first of the New Year. Comfortable temperatures, sunny skies, and warm water are a magnet for those seeking a respite from the cold winters up north. Additionally, many special events are planned during this time, be sure to ask us about what is happening during your visit. Our guests will be greeted at the airport or your hotel and transported to St. Thomas Yacht Club to board Kingdom. There you will be welcomed with a refreshing tropical drink, and assistance in getting settled into Staterooms and tour of the yacht. Captain Walt will review last minute weather conditions and itinerary plans, before leaving for our first destination. After disembarking Kingdom, you will be transported back to the airport, or hotel of your choice. Breakfast will be served every morning aboard, usually before departure to your next destination. We have found our guests occasionally enjoy dining ashore to more fully experience the Virgin Islands; therefore on board dining includes 5 lunches and 4 dinners. It will be our pleasure to recommend the right spots for you, from upscale restaurants to popular beach bars. We will provide transportation to and from Kingdom to shore for all of your excursions. On board refreshments are included, with a well stocked select bar, beer and wine, soft drinks, bottled water, coffee, tea and juices. Your preferences are discussed during booking, and all attempts will be made to accommodate your wishes regarding beverages and menus. However, if additional premium beverages are desired, this will be at additional cost. Kingdom has two kayaks aboard for our guests use. Four adult sets of snorkels, masks, and fins are available. Additionally, four papasan floating chairs for refreshing and relaxing at the same time are available. All these toys are easily accessed from the stern swim platform, which is equipped with a ladder. Your crew will be happy to suggest and arrange Scuba Diving trips, Shore tours, Private Guides or other requests. Payment for these activities will be the responsibility of the guest, at the time of booking. Charters begin from St. Thomas Yacht Club on Saturdays, returning to St. Thomas Yacht Club the following Saturday. Other departure and return destinations or accommodations for special dates will be considered on an individual basis, please don’t hesitate to ask. The details of the yachts below are indicative. The specifications (including the number of berths, cabins and heads) of Kingdom Yacht Charters LLC's yachts may vary. Please confirm the details with Kingdom Yacht Charters LLC. There are no user reviews for Kingdom Yacht Charters LLC yet. Be the first to add a review.